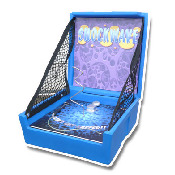 Shock Wave is an exciting carnival game. Participants will need to guide the loop over a twisted wire without touching it. A touch will cause a shock simulation by ringing the bell.